Truth is a process, not just an end-state. The Righteous Mind was about the obstacles to that process, such as confirmation bias, motivated reasoning, tribalism, and the worship of sacred values. Given the many ways that our moral psychology warps our reasoning, it’s a wonder we’ve gotten as far as we have, as a species. That’s what’s so brilliant about science: it is a way of putting people together so that they challenge each other and cancel out each others’ confirmation biases and tribal commitments. The truth emerges from the interaction of flawed individuals. But something alarming has happened to the academy since the 1990s. As the graph below shows, it has been transformed from an institution that leans to the left, which is not a big problem, into an institution that is almost entirely on the left, which is a very big problem. Nowadays there are no conservatives or libertarians in most academic departments in the humanities and social sciences. (See Langbert, Quain, & Klein, 2016 for more recent findings on research universities; and see Langbert 2018 for similar findings in liberal arts colleges.) The academy has been so focused on attaining diversity by race and gender (which are valuable) that it has created a hostile climate for people who think differently. The American Academy has–arguably–become a politically orthodox and quasi-religious institution. When everyone shares the same politics and prejudices, the disconfirmation process breaks down. Political orthodoxy is particularly dangerous for the social sciences, which grapple with so many controversial topics (such as race, gender, poverty, inequality, immigration, and politics). America needs innovative and trustworthy research on all these topics, but can a social science that lacks viewpoint diversity produce reliable findings? I am a non-partisan centrist, and I am very concerned about the loss of viewpoint diversity in the academy. I believe the problem is amplified by the rising political polarization of the United States more generally. I therefore teamed up with two dozen professors in psychology and other disciplines (most of whom are not conservative) to create the site HeterodoxAcademy.org. Our goal is to make the case, consistently and forcefully, that the academy must increase viewpoint diversity in order to function effectively. We launched the site in September 2015, just before a wave of student protests at Yale and other schools increased pressures toward political orthodoxy. 2) Where microaggressions really come from. (2015) This is my summary of an extraordinary essay by sociologists Bradley Campbell and Jason Manning. They show how a new “culture of victimhood” is emerging on America’s most progressive college campuses in which the main paths to gaining prestige are either to advertise one’s victimhood or to attack others in the name of defending victims. This culture weakens students and guarantees unending strife. This essay is essential reading for anyone who thinks that campus protesters’ demands for more sensitivity training, affirmative action, and ethnic studies centers are going to help future students feel less marginalized on campus. In fact, those measures are likely to backfire. College presidents and deans who accede to their demands are committing their institutions to a firmer embrace of victimhood culture, which means that in a few years they can expect: thinner skins, more anger, more feelings of marginalization, more accusations of racism/sexism, more restrictions on free speech, and more demands for… more victimhood culture. This could turn into a death spiral for any college that starts down this path. But once a university has lost its political diversity, there may be nobody left on campus who is willing to stand up and say “um, maybe this is a bad idea, here’s another way to look at things.” For more on microaggressions, see Lilienfeld’s 2017 analysis and critique of the concept, and my commentary on Lilienfeld, pointing out that microaggression training teaches the opposite of ancient wisdom. 4) How Marcuse made today’s students less tolerant than their parents (2015). by April Kelly-Woessner. Describes the resurgence of influence of Herbert Marcuse, who argued in the 1960s that true “liberating” tolerance requires suppressing all non-progressive voices. Kelly-Woessner shows the big split in American opinion on matters of free speech: Millennials embrace Marcusian ideals much more than did previous generations, and it is this moralistic illiberalism that leads to the witch-hunts and ultimatums that are sweeping across American college campuses since Halloween 2015. (Two months after Kelly-Woessner posted the essay, Pew research published strong confirmation of her argument: 40% of Millennials OK with limiting speech offensive to minorities). 6) How concept creep is closing down minds (2016). This is an essay I wrote with Nick Haslam in The Guardian (UK) explaining Haslam’s academic paper on “concept creep.” The campus trend to lower the bar on concepts useful for extending victimhood culture (e.g., bullying & trauma) may end up making students more fragile and depriving them of challenges to their favored ideas. For a condensed version of Haslam’s paper click here. 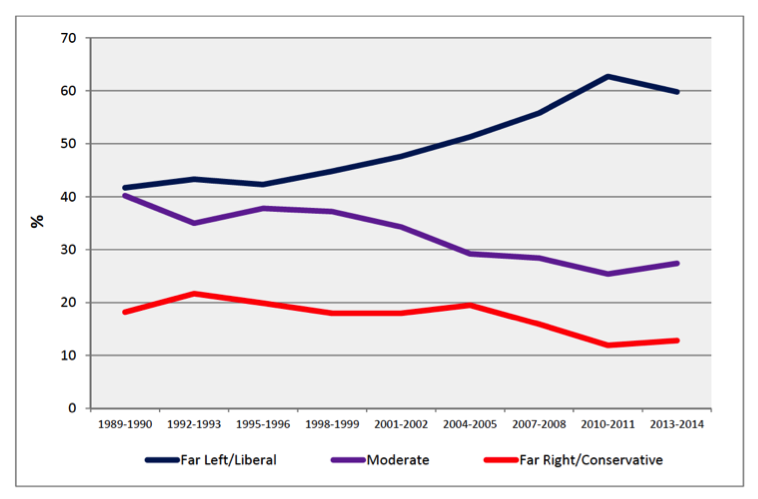 7) The split between the liberal left and the illiberal left. Jonathan Chait at New York Magazine has been calling attention to the growing illiberalism of one faction of the left since early 2015. See Not a Very P.C. Thing to Say. More recently, he has offered the most succinct explanation of the mindset of the illiberal left in this essay: Oh, Good, It’s 2016 and We’re Arguing About Whether Marxism Works: “The problem with Marxism, I argue, lies in its class-based model of economic rights. Liberalism believes in political rights for everybody, regardless of the content of their ideas. Marxists believe political rights belong only to those arguing on behalf of the oppressed — i.e., people who agree with Marxists.” This is exactly the Marcusian turn that many American universities are now taking. It is noteworthy that many true liberals–including Nick Kristof and president Obama–have urged students and universities to reject this illiberal turn and seek out political diversity. 8) Hard truths about race on campus (2016). This is an essay I wrote with Lee Jussim in The Wall Street Journal. As social psychologists, we are alarmed that so many college presidents are giving in to demands that they do things that are likely–based on existing imperfect evidence–to make things worse for everyone, especially black students. We urge universities to copy the example of the US Army: Use affirmative action but without lowering standards for any race; reduce or eliminate “ethnic enclaves;” and foster a sense of unity, not division. In a followup essay, I showed the amazing 1969 prophecy by judge Macklin Fleming, in which he predicted the problems that the use of large racial preferences would cause. His essay helps us see exactly how racial preferences have led to feelings of marginalization by black students, which has in turn led to a tense and politicized environment on campus that is hostile to free inquiry about politically controversial topics. 9) Intimidation is the new normal on campus. In 2017, in the wake of the election of Donald Trump, passions grew stronger and we began to see actual physical violence on campus as a response to speakers deemed unacceptable. The violence at UC Berkeley and at Middlebury was a wakeup call to many professors, and we saw a sharp rise in applications to join Heterodox Academy. In this essay in the Chronicle of Higher Education I explored the causes and implications of these trends. Even though actual violence is still rare, the fact that a non-orthodox speaker might draw a protest crowd, and the protest crowd might contain members of antifa (including some students) means that anyone who challenges the political consensus on campus must now at least think about issues of physical safety and be worried if a crowd of students approaches. It gets worse. As physical intimidation from students on the political left was increasing ON campus, threats of violence from the political right OFF campus were becoming much more common too, with death threats and racist slurs aimed at professors who said something provocative (and sometimes outrageous) that got picked up and sometimes distorted by right-wing media. I explained the causes and consequences of this alarming new development in a blog post at HxA titled Professors must now fear intimidation from both sides. 10) Are words violence? The second most unfortunate trend on campus in 2017, after the rise of actual violence, was the rapid spread of the idea that words are violence (and therefore, violence to stop people from speaking is justified self defense). An op-ed in the New York Times, by a psychologist I like and admire, tried to ground this argument on neuroscience: words can cause stress, stress can cause physical damage, therefore words can be violence. I thought the essay made some logical errors (words can cause physical harm, but that doesn’t mean that they are violent) and some psychological errors (such as misunderstanding antifragility, and recommending policies that would make students more fragile). I showed why the op-ed was wrong and harmful (but not violent) in an essay in The Atlantic, with Greg Lukianoff: Why its a bad idea to tell students words are violence. 2) Political diversity will improve social psychological science. This is a condensed version of the paper I wrote with 5 colleagues documenting the loss of viewpoint diversity in social psychology, and the problems that has caused. 3) The Backstory of the AEI-Brookings Poverty Report. This essay shows the value of viewpoint diversity. It’s about how a deliberate decision to cultivate viewpoint diversity led to a breakthrough report on poverty, drawing on the best ideas from both sides. 2) Jason Stanley, The Free Speech Fallacy. Chronicle of Higher Ed. 4) Jeffrey A. Sachs and Matt Yglesias each argued that there is no free speech crisis on campus, it’s just a moral panic. My response is here (with Sean Stevens). 2) The OpenMind Platform: A fun and powerful educational technology system that prepares students to benefit from viewpoint diversity. 3) All Minus One: John Stuart Mill’s Ideas on Free Speech, Illustrated A free ebook (or $3 Kindle book) to bring the best arguments ever made for free speech from the 19th century to the 21st century. E) Here are the major talks I have given on viewpoint diversity. (You can find these and others on the viewpoint diversity playlist on my YouTube channel). 1) Why universities must choose one telos: Truth or social justice. (Talk at Duke, October, 2016) Here’s a blog post giving the background. 2) Coddle U. vs Strengthen U. (Talk at Yale, Sept. 2015) Here’s a blog post giving the background. 4) My Wriston lecture at the Manhattan Institute, Nov. 2017, on “The age of outrage: What it’s doing to our universities, and our country”. My talk begins at 12:30. I explore the centrifugal forces tearing apart the United States, and then show how those forces are playing out on campus. Universities should be dangerous places. Spiked (UK) podcast interview (4/10/16), gives an overview of the history of what has happened, and what it’s like to teach in a minefield.